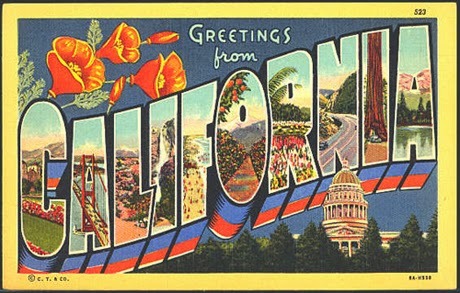 When I thought about different possibilities for California's state pie, I considered two fruits - avocado and Meyer lemons. I chose the latter. Plump, smooth skinned and the color of canary yellow, Meyer lemons are sweeter and less acidic than their sour cousins. Once hard to find outside of California, these aromatic lemons have become increasingly common in grocery stores. Originally imported from China about 100 years ago, Meyer lemons are a cross between a lemon and a sweet orange. With their sweeter juice, thinner peel, less acid and a more floral scent and taste, Meyers are the perfect ingredient for desserts. 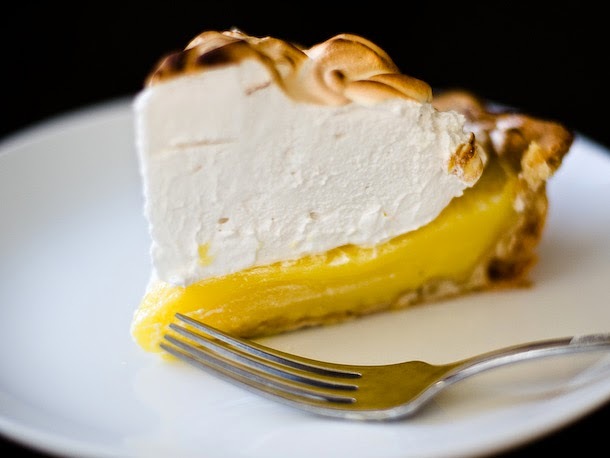 Lemon meringue is a custard base pie with a fluffy meringue topping. Because of its few ingredients, be choosy - there's no substitute for fresh, juicy lemons. This recipe is topped with Swiss meringue instead of a raw French meringue topping. Preheat the oven to 425º F. Line the shaped, chilled, pie crust with parchment or foil and fill with weights and bake for 15 minutes on the lower rack. Remove the liner and weights and bake until the whole crust is golden brown. Remove from the oven and allow to cool. Place the lemon juice, water, and zest in a medium sized saucepan. Whisk together the cornstarch, 1 1/3 cups sugar, and salt, and add it to the saucepan. Whisk the egg yolks then add them to the mixture and whisk continuously over medium heat until the mixture becomes thick and bubbles, 7 to 8 minutes. Whisk for an additional two minutes once it's begun to bubble, without stopping, then remove from heat. Whisk in the butter until it is completely melted. Pour the mixture into the baked pie shell and press plastic wrap directly onto the surface. Allow the pie to come to room temperature, then chill for at least four hours (ideally, overnight) with the plastic wrap still on top. Before serving: Fill medium saucepan on quarter full with water. Set the saucepan over medium heat, and bring water to a simmer. Combine egg whites, remaining sugar, and cream of tartar in the heatproof bowl of electric mixer and place over saucepan. Whisk constantly until sugar is dissolved and whites are warm to the touch, 3 to 3 1/2 minutes. Test by rubbing between your fingers. Transfer bowl to electric mixer fitted with the whisk attachment, and whip, starting on low speed, gradually increasing to high until stiff, glossy peaks form, about 10 minutes. Add vanilla, and mix until combined. Remove the plastic from the top of the chilled pie and top with the meringue. Place the pie under the broiler and watch it carefully, the top should brown but not burn, and it charges quickly. Chill for 10 minutes, then serve.